12th Man Texas A&M Aggies Jersey, 12th Man Jersey, Authentic 12th Man Texas A&M Aggies Jerseys for sale online. Pay homage to a great of the gridiron with a 12th Man Jersey or T-Shirt from the ultimate sports store. We stock throwback Texas A&M Aggies Jerseys from Nike and Adidas and Under Armour and Authentic 12th Man Texas A&M Aggies Jerseys for Texas A&M Aggies fans. 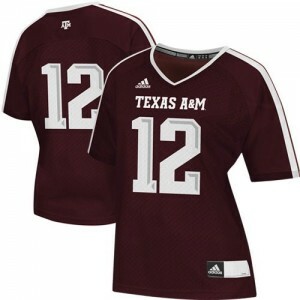 Shop only Officially Licensed 12th Man Texas A&M Aggies Jerseys, Shirts and 12th Man Texas A&M Aggies Merchandise at collegeprostore.com where our fast shipping and 365 day NO-Hassle returns.